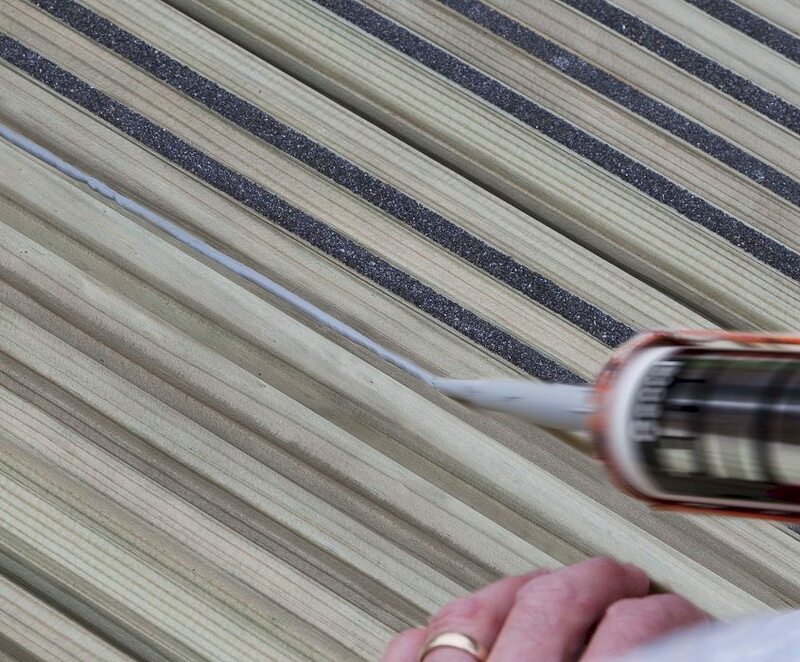 This is an excellent method of putting grip back onto your timber decking. 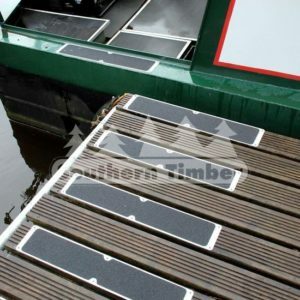 Timber decking board surfaces are exposed to sunlight, rain and frost and will inevitably change appearance very soon after fitting. Whether the decked area is in a domestic or commercial setting it will require periodic attention to keep it looking good as well as preserving the decking’s service life. Where regular maintenance isn’t enough to minimise the risk of a slip then RetroGrip is an option. Stairs are probably the most obvious risk area. 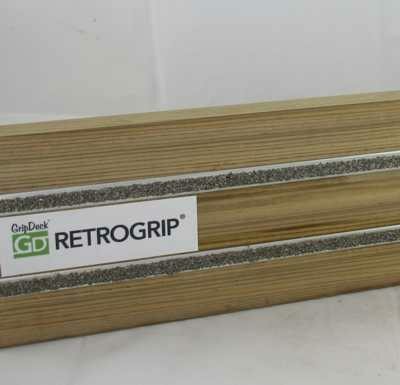 While it is possible to install Premier Grit Strip deckboards in new decking structures there has to be a better option for existing decks, The simplest solution, requiring the least amount of ongoing care will be to drop a RetroGrip® insert into your deckboard grooves. RetroGrip will last for years and keep you safe on your feet, what ever the weather. 1. 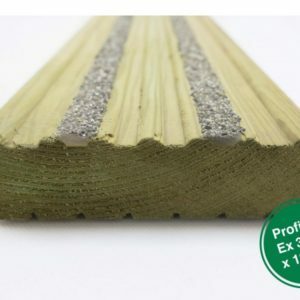 Drop your RetroGrip® insert into the decking grooves to check it fits, it is recommended to fit two RetroGrip® inserts per standard width deck board, to ensure good anti slip coverage. RetroGrip® inserts can be cut to length with an angle grinder, using a metal cutting disc or diamond blade. 2. Pump a generous line of Geocel theWorks Adhesive or equivalent into a clean and dry decking groove, the length of each insert. The adhesive should fill the groove to within 2-3 mm of the top of the decking board / groove. 3. Drop in the insert and push down level. Glue and drop in 1 insert at a time. DO NOT leave the adhesive for longer than 20 seconds before dropping in the RetroGrip® insert and wipe off any excess adhesive from the decking. 4. Leave for 12 – 24 hours to cure. DO NOT walk on during this time. Leave for longer to cure if the outside temperature is below 5 degrees centigrade. 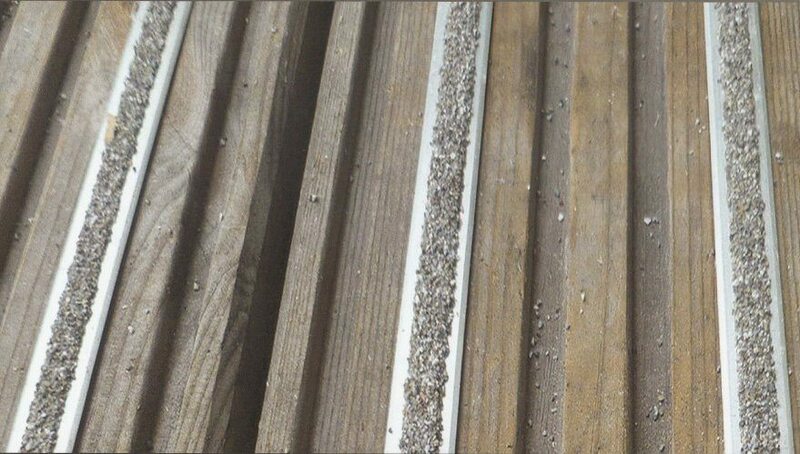 Please note, in high footfall commercial areas or when using on uneven decking, use RetroGrip® Screws and a power drill, to screw down the inserts. Please ask for more details.